Canadian safety regulators have launched a formal investigation into reports that some Ram pickups and Dodge Durango SUVs can roll away when their rotary gear selectors are in park. Transport Canada says it has documented 12 complaints of 2013-2017 Ram 1500 and 2014-2016 Durango vehicles rolling away unexpectedly. Four low-speed collisions, two with minor injuries, were reported. 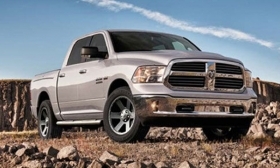 The agency also is investigating FCA Canada over continuing brake booster problems in 2011-2014 Durangos and Jeep Grand Cherokees that were recalled in 2014 to have faulty boosters replaced. Transport Canada acknowledged in December 2016 that it was examining the rollaway issue, which has been linked to 25 crashes and nine injuries in the United States. As many as one million Rams and Durangos in the United States are equipped with the rotary selectors. Transport Canada said it was still awaiting information on the number of Canadian vehicles affected. The agency recommends that drivers always apply their parking brake when their vehicle is parked. In a 2016 recall involving a different gear sector unit, FCA said it would repair more than 1.1 million cars and SUVs worldwide that could roll away after the driver exited. Transport Canada said five owners have reported "hard" brake pedals and extended stopping distances in 2011-2014 Durangos and Grand Cherokees repaired under the 2014 recall that covered more than 42,000 vehicles. Dealers were instructed to install shields to prevent water from entering the boosters and freezing, and to replace any booster with an unacceptable loss of vacuum pressure. "A review of the adequacy of the repair and repair procedure is in progress," an agency spokesman said. FCA Canada is co-operating in both investigations. On the brake booster issue, FCA is sharing findings from field surveys and the analysis of recovered parts, the spokesman added. The manufacturer did not respond to requests for comment.